Invite a little more of a Vibrant Glow into your day with our delicious golden blend of sea buckthorn and citrus fruit herbal tea. Our super-healing sea buckthorn blend, Vibrant Glow, is a delightful citrussy tea with powerful anti-inflammatory benefits. Sea buckthorn is a natural anti-inflammatory that supports the health of your heart, skin, mobility, digestive system, and the liver. It reduces oxidative stress and boosts your overall energy naturally- without caffeine! Sea buckthorn is also very healing for those who struggle with gout and uric acid buildup. Our vibrant blend steeps up a sunshine-yellow golden liquor, with a sweet lime aroma. At first taste, the complimentary taste of orange, pineapple, and tart key lime combine with the unique sweet taste of sea buckthorn for a refreshing taste that will have you glowing from the inside out. 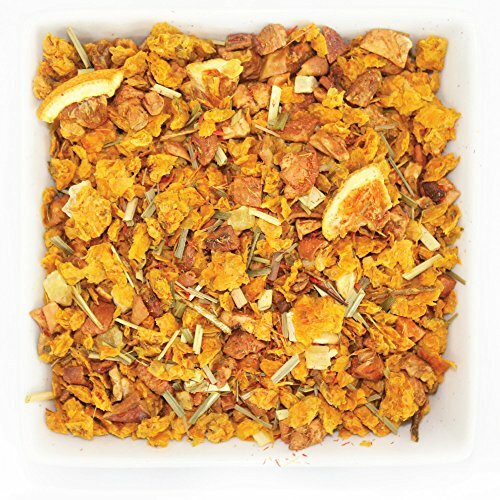 Our super-healing sea buckthorn blend, Vibrant Glow, is a delightful citrussy tea with powerful anti-inflammatory benefits. Our vibrant blend steeps up a sunshine-yellow golden liquor, with a sweet lime aroma.